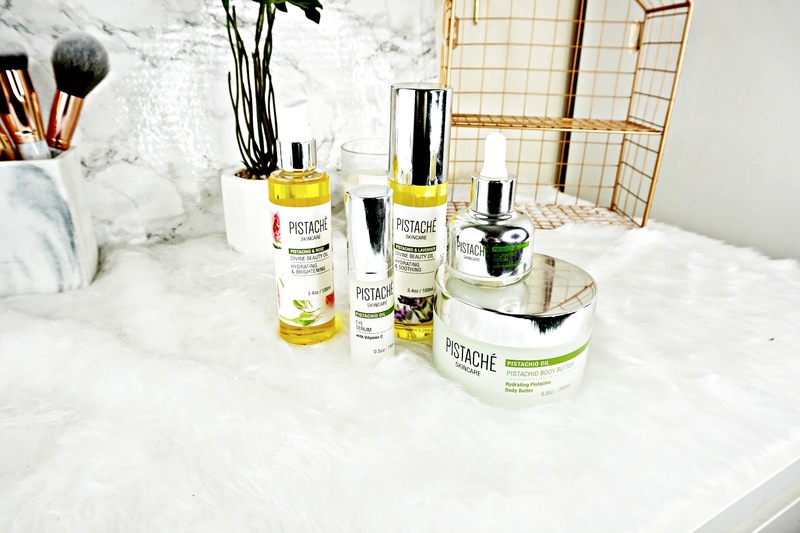 Pistache skincare is such an underrated brand! Their whole line of products is formulated with Pistachio oil. Which is a powerful natural ingredient, that's rich in vitamins and minerals. All products are formulated with natural, yet effective ingredients. Including Gylcolic acid from Sugar Cane. I've been testing a few of their products.. I can't get enough of this stuff! It smells insane, like Cherry Bakewells and Almonds! It has a rich nourishing formula, that absorbs quickly into the skin. Soothing dry areas and hydrating the skin. It doesn't feel heavy or greasy on the skin either. The scent lasts for ages on the skin to. It's a brilliant hydrating body cream. I've also been testing this serum and it's become a staple in my routine. This feather light serum combines super hydrating Pistachio oil with Hyluronic acid to offer deep hydration. Which this really does! It can be used in the morning or evening, I've found it works great in both routines. It absorbs really quickly and instantly hydrates my skin. It's definitely helped plump out my dehydration lines and keeps my skin supple. I love the packaging of this to. I'm really into eye creams at the moment and this one has been a welcomed addition to my routine. It contains Vitamin C which is great for brightening and refining the skin. Alongside, Persian Silk Tree oil which helps protect the skin from the environment. The cream itself is really light on the skin and absorbs quickly. I love how refreshing this feels to! My under eyes have been so dry recently and this has really helped to keep them hydrated. To finish off my skincare routine I've been using this moisturiser. Which I've been really enjoying. This contains Vitamin E which is great for hydration. It doesn't sit on my skin or leave it feeling greasy. It works really well under makeup and keeps my skin hydrated and smooth all day. It's a really nice fuss free moisturiser that does the job. Last but not least I have these Two oils that can be used on the hair, face and body. I have the Rose Divine Beauty Oil and the Lavender Divine Beauty Oil. Both smell incredible! Both are super hydrating and have a light formula that doesn't feel heavy on the skin. They are such lovely oils to use. All Pistache skincare is cruelty free, Parben free and doesn't contain any artificial colour or fragrance. I'm really impressed with the products I have tried so far. You can check them out on Beauty Bridge which offers worldwide shipping at the flat rate of $10. They're also available on Amazon here.